The world's best-selling electric vehicle (EV) is fast becoming the taxi drivers' favourite too; attracted by lower running costs and fuelled by a desire to reduce airborne pollution in city centres. One of the strongest advocates of the Nissan LEAF as a taxi is Amsterdam-based Taxi-E company. With a fleet of 13 Nissan LEAF's, the firms' drivers have covered over 700,000 kms - that's further than the distance of the earth to the moon. The cars are quick-charged two or three times a day using 100 per cent green energy, meaning they're always ready for passengers. One of the entrepreneurs behind Taxi-E, Ruud Zandvliet, said: "Amsterdam has some 3,000 taxis, so while our fleet is helping to reduce emissions, there is obviously room to reduce these even further." Switzerland's largest city, Zurich, will soon have a fleet of pure electric Nissan LEAF taxis moving people around the city. 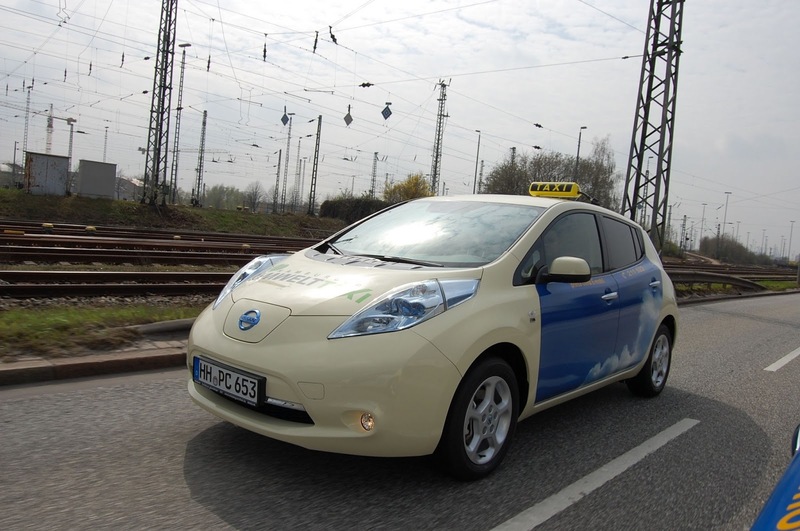 Later this year, ten Nissan LEAFs will hit the road supported by a network of city-wide fast chargers as part of Zurich city's plans to make 15 per cent of its taxi fleet electric by 2015. Capable of replenishing a battery to 80% in just 30 minutes, with many customers arriving with partially full batteries, the average stay is just 15 minutes. The Nissan LEAF is also a hit with European taxi owner-drivers where running costs, fuel bills and maintenance down time are critical to their success. These road warriors are fast-becoming EV advocates showing colleagues the benefits of making the switch from diesel to electric. In the UK, Phoenix Taxis runs a Nissan LEAF as part of its fleet and has installed three EV charging points at its headquarters in Blyth, Northumberland. Managing Director Alexander Hurst said: "The main cost to any taxi driver is fuel. With prices rocketing on a monthly basis, EVs are becoming the more sensible fleet vehicle cost." "LEAF is incredibly luxurious and taxi drivers - notoriously unhappy with change - love the way LEAF drives. The gadgets available via the steering wheel also help make drivers' lives easier. With real-time savings of £5,000 (€5,900) a year in fuel, we're expanding our fleet and will have 15 LEAFs on the road by summer 2014." In Portugal, the first country to sell Nissan LEAF in Europe, Lisbon-based owner-driver José Ferreira replaced his diesel-powered taxi with a Nissan LEAF. He has driven more than 15,000 kms so far, covering 80-100 kms a day, and reveals that 70 per cent of his customers liked the experience so much they would actively choose to ride in an electric taxi. Fuel and running costs are the biggest factors for taxi owner-drivers, meaning every Euro counts. Owner-driver Roberto San José from Valladolid, Spain has spent just €1,800 on electricity to power his Nissan LEAF for more than 77,000 kilometres. Fuel for a diesel-powered car would have cost more than €10,000, saving Roberto over €8,200. Taxi bosses at Prima Clima are making their mark on the taxi business in Hamburg, Germany, with a fleet of four LEAFs. Liveried in the world-famous, pale-yellow body colour of all German taxis - with contrasting doors displaying blue skies and clouds - this fleet is backed by the city's Council and supported by 50 EV charging points and two quick chargers. Jean-Pierre Diernaz, Director Electric Vehicles Europe, said: "There is little doubt that the Nissan LEAF is an ideal vehicle for taxi operators. It's cheap to run and easy to maintain. It's good to drive and passengers like the space and comfort. "From a driver's point of view, LEAF's brisk acceleration allows it to easily keep with the traffic flow and the growth in quick-charging networks provides easier access to rapid ‘refuelling'. With zero-emissions and whisper-quiet running, just one Nissan LEAF can make a difference to life in the city."